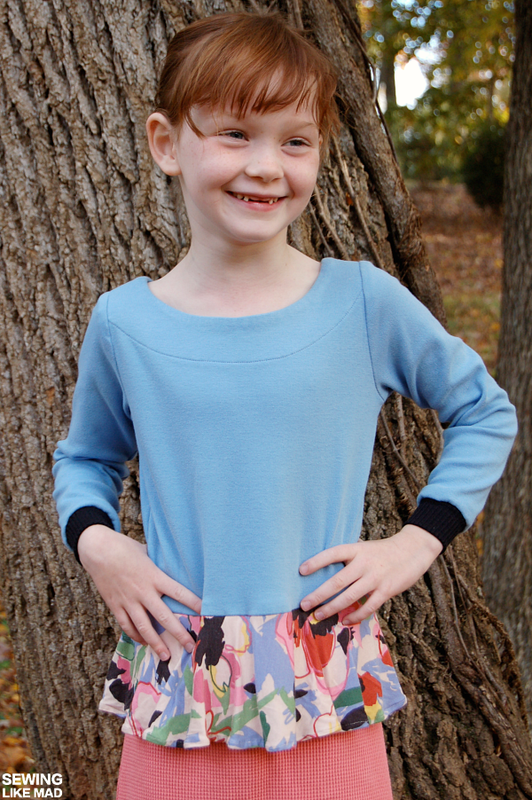 Little miss Toothless would like to present you her two new Pretty in Peplum Dresses. She loves those dresses and so do I. The pattern is designed by the lovely Abby from Sew Much Ado and she has done an amazing job making a pattern that is not only super pleasant to work with but also results in a dress that is comfortable to wear but looks super stylish. I made her a size 7 and since she turns 7 in 2 months I would say the fit is perfect. Overall this pattern is simply perfection. Honestly it is not very often I come across a pattern where I don't want to change a thing.....this is one of them. Go Abby! Okay, I would love for the seam allowance to be metric instead of imperial but that barely counts as a complaint, right haha. Do you know what I really really love? That the peplum is made in one piece - no side seams. Cool! And if you extend the peplum you suddenly have a full circle skirt (which I used to make knit princess dresses for our upcoming Disney trip but that is another story for another post!). The fabric for this version is mostly from Organic Cotton Plus. 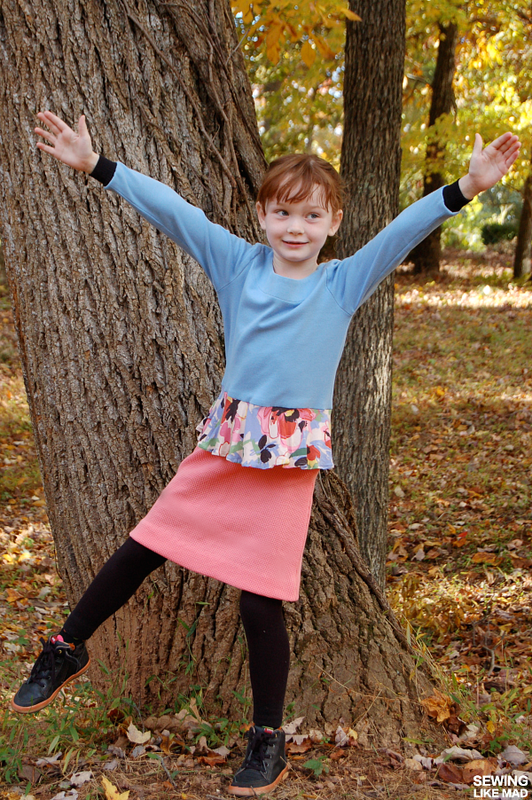 The blue is organic interlock and the skirt is organic thermal knit. The printed knit is something I had forever and I have no idea where I bought it. But it is thin and has a drape that is perfect for peplums. Both the organic knits are soooo lovely in the quality but I need to tell you about my mistake working with thermal knit for the first time - just so you don't do the same mistake. Yeah, arghhhhh is the word you are looking for. This was after sewing and then trying to smoothen things out with some good ol' pressing....that did not help things either like it usually does. 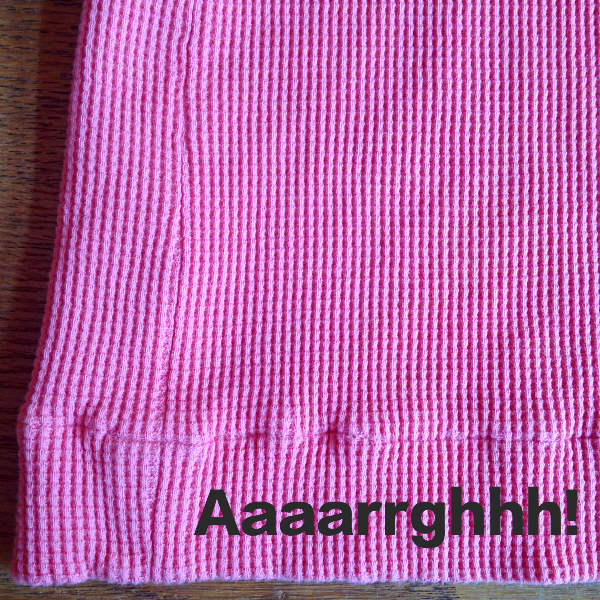 The waffle texture in the thermal knit simply stretched out and flattened and looked like.....yeah, not good! I don't want to say it it the fabric's fault because honestly the quality is super yummy and as you can see the side seam was sewed together and pressed easily (because it was along the grain and not against it). Sometimes there is just certain things you can't do with certain fabrics. A cover lock might have worked too (just guessing here) but I don't have one of those machines so that was not an option. So what fixed it? Cutting a new skirt and hemming it by hand. If you want to make t-shirts in this fabric (which is normally what thermal knit is used for) I would suggest you hem it with a knit rib cuff. Also be careful when you press. Lots of steam but lightweight weight when you press. Problem solved. I did one tiny change to the pattern. I changed it from a straight skirt to an A-line skirt. I wanted to take it one notch closer to an everyday dress and to me this was the obvious solution. Below there is a ultra mini tutorial on how to do that. I aligned a long ruler with the hip and then added 4 cm/1.5" to the bottom and remembered to raise up the bottom hem so the corner stays 90 degrees. 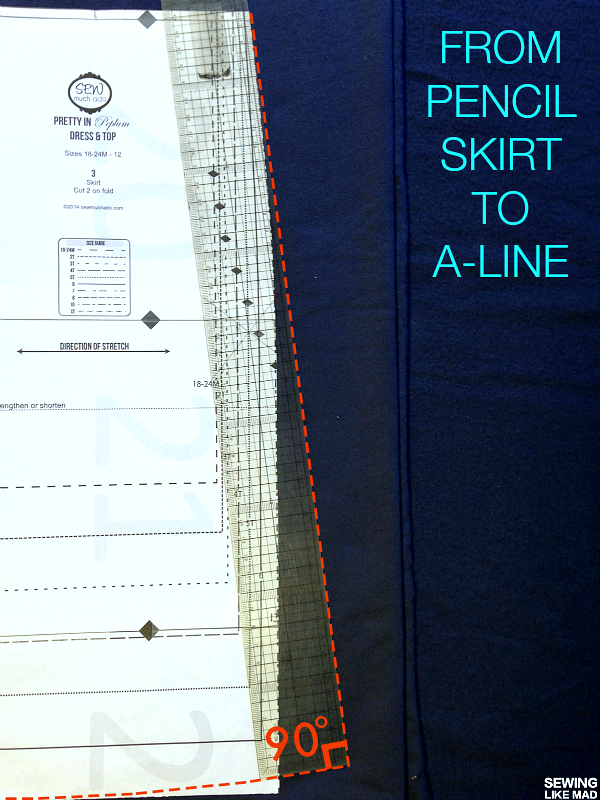 Make a new smooth curved hem that meets the original center front/back hem. I also made another version in cotton sweatshirt fleece. 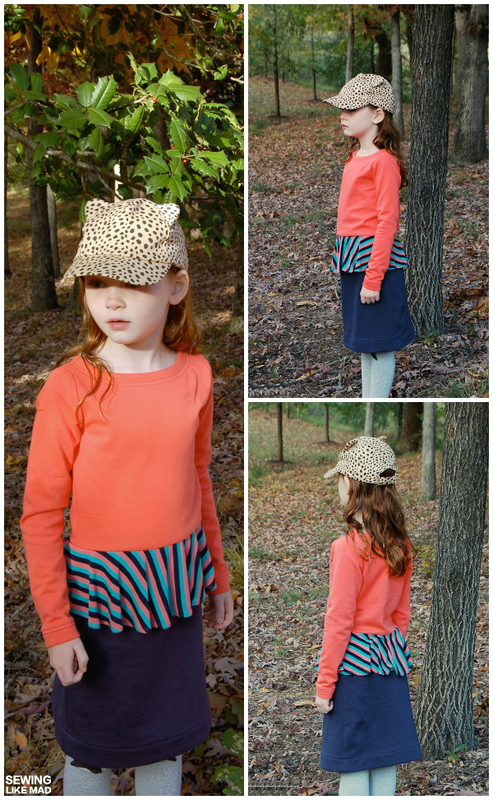 Both coral and indigo from Girl Charlee. The stripe was another mystery fabric from the stash. The sweatshirt fleece barely has any stretch - like that type usually never has but it still totally works. She has complained a tiny bit that it is hard for her to get in and out of but she has still managed to do it on her own so I'm not too worried. She wore it today to a birthday at a science museum and it was so so perfect. She has worn it to school too - it's a winner! And did the official double needle hater (or actually I think they hate me) change her mind? Nope, I just stitched too times, ha. Get your own pattern HERE. Oh, and there is actually a Pretty in Peplum tour going on right now with some aaaamazing dresses and tops. You can get links to them all right HERE at Sew Much Ado. Looove both dresses Mie! She is too cute! And now I never want to work with waffle knit, lol. Ha, it's a winner when they pick it out to wear to school! Love this...I've never been drawn to the peplum styles, but I love this on her, and I think my own little 7-year-old would love it!